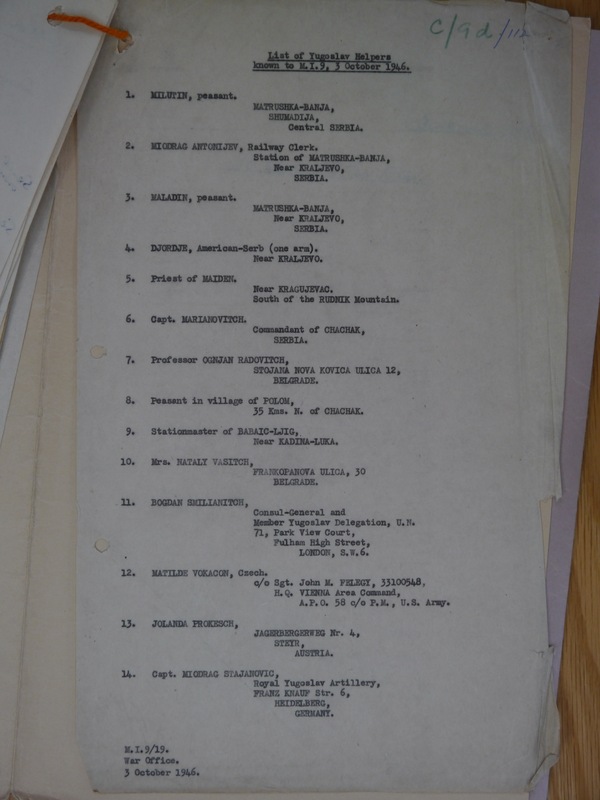 In a file on Hungarian and Yugoslavian helpers of Allied airmen that researcher John Howes located at the British National Archives there was a single one-page document specifically devoted to Yugoslavian helpers. (There are also some scattered references to Yugoslavians mixed in with the Hungarian records.) Yugoslavian help to Allied airmen is well-known. Why there was just this one list, I don’t know. If I find more information at the US National Archives on Yugoslavian helpers when I visit it in May, I will add it here. Note that the correct citation of the source for the Hungarian and Yugoslavian records at The National Archives of the UK is WO 208/5479 Hungary & Yugoslavia. I have made a typed list of the 14 names that appear on the Yugoslavian list so that they can be found during an Internet search. The image follows the typed list. SMILIANITCH, Bogdan, Consul-General and Member Yugoslav Delegation, U.N.